Spanish Fork FFA is celebrating along with chapters around the country, the amazing accomplishments of members, teachers, and the industry of agriculture. 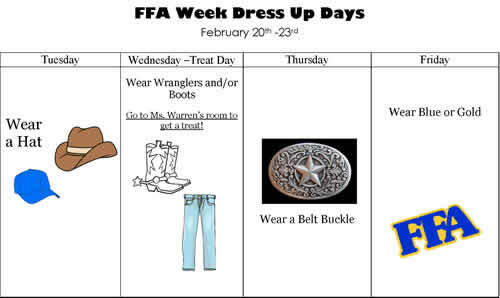 Our FFA members are sponsoring dress up days throughout the week. See the calendar below or our Facebook page for more details. The Girls Who Code Club program is a free program for girls in grades 6-12 that provides engaging project-based activities. The 8th grade US History classes had the opportunity to visit the Utah state capitol building on Friday and got to see government working full throttle. Students watched a session of Congress in which the families of Utah’s fallen soldiers were honored and took a peek at the building’s new earthquake absorption mechanisms. They spoke with Representative Mike McKell and got a special tour of the Supreme Court from him and our own Mayor Leifson. They even got to have a question and answer period with Senator Diedre Henderson! On February 8, 2018, the students in Mrs. Mendonsa’s class had a great and wonderful time watching Mrs. Mendonsa share with them parts of a pig. She brought a pig heart, lungs, esophagus, and larynx into class with her. With a shop vacuum, she was able to blow the pig lungs up and show how the lungs of a pig and human work. With the pig heart, she showed us how many chambers it had and where most of the organs attached to the heart in order for everything to work out. The class had a fun time and was able to learn about the inside of a pig. Mrs. Wilson provided a special treat in the library for some lucky 7th grade Reading classes on Valentines Day. The students got to "speed date" with their favorite books. They took turns sharing what they loved about their book to try and help their classmates find new reading material. The students had lively conversations and ended the activity with a sweet sugar cookie treat. Thanks to Mrs. Wilson for putting together this awesome activity! Read more about Speed Date with a Book! Our third and final parent-teacher conference for this school year will be this Thursday, February 15 from 3:30 to 8:00. Teachers will be available in the cafeteria from 3:30 to 6. From 6 to 8 teachers will be available in their classrooms. We invite all parents and guardians to come meet with their students' teachers. Have you ever wondered what the Advanced Learning Center is and what you can do there? Registration for the ALC field Trip goes from now until February 23rd. The field trip is February 26th. You will see the many classes you can take learn how the classes can give you college credit while still in high school! Our school will be attending the morning session. Sign up now in the counseling office because we have only 60 slots available.